Authentic Asia Vietnam & Cambodia! Ports of Call Siem Reap, Phnom Penh, Sa Dec, My Tho, Saigon, Kampong Chhnang, Kampong Tralach, Tan Chau. Surely no where boasts a more captivating array of culture, rituals and ruins than Vietnam and Cambodia. 7 night luxury cruise with soft drinks, local beer, spirits, and on board gratuities. Deluxe accommodation: 2 nights at Raffles Hotel d'Angkor, Siem Reap and 2 nights at Caravelle Hotel, Saigon. Breakfast daily, lunch and dinner as specified in the itinerary. Extensive sightseeing with expect local guides, all transfers and taxes. *Prices valid for new bookings only. Prices are per person in AUD, based on twin share accommodation. Single occupancy prices are available at a supplement as stated.Prices include return Economy class international airfare from Sydney, Melbourne, Brisbane, Adelaide or Perth including air taxes. Ask at time of booking. Prices include 7 night cruise aboard Cruiseco Adventurer with port charges and on board gratuities, accommodation and flights as stated in the itinerary. All offers are capacity controlled and can be withdrawn at any time without notice. Flights and land arrangements for departures within 60 days to departure are subject to availability. Ask your travel agent for more information. Travel insurance is mandatory and is at an additional cost. Does not include any additional accommodation or transfers made necessary due to flight schedules however this is available at additional cost. Prices are subject to change due to fluctuations in charges, taxes and currency. Subject to availability at time of booking. Cancellation fees and conditions apply. For full terms and conditions see the Cruiseco Authentic Asia Vietnam Cambodia 2018-2019 . 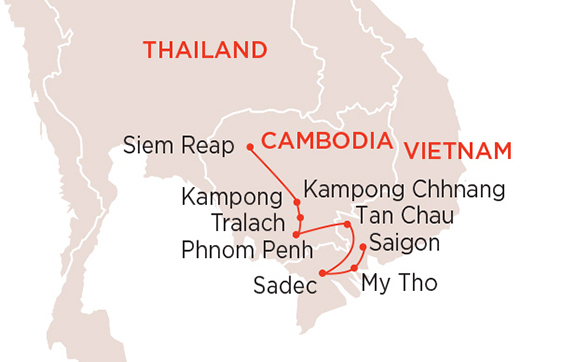 NOTE: Cruise is also offered in reverse: Siem Reap to Saigon. Fly to Saigon via Singapore, on arrival transfer to the Caravelle Hotel, Saigon. Today includes a sightseeing tour of Saigon’s highlights; you will also enjoy lunch at a local restaurant before an afternoon & evening at leisure. Embark the luxurious Cruiseco Adventurer and set sail for Cai Be. This evening after dinner & drinks you will enjoy local folk performances about life on the Mekong Delta. Today’s highlight is Tan Chau. Enjoy sightseeing by water aboard local boats, navigating narrow channels & then tour the town by rickshaw. Enjoy cocktails & dinner back onboard this evening with your fellow travellers. Visit the Capital of Cambodia Phnom Penh where you will visit all of the main attractions. This afternoon the option is available to learn more of Cambodia’s past with a visit the Khmer Rouge’s Toul Sleng (S21 Detention Centre) and the Killing Fields. This evening enjoy Khmer folk dancing and songs. A free morning in Phnom Pehn to wander the markets or for more sightseeing before midday when the ship sails for Chong Koh, here you will visit traditional handicraft workshops and learn about their skills. In Oudong you will visit a Buddhist monastery and meditation centre. Before travelling to Kapong Tralach Pleu where you will take an ox-cart ride to the Tonle River, travelling through the countryside, past rice fields and amused locals. Note: The Tonle Sap Lake’s water level varies; an alternative itinerary may be followed if it’s too low. Kampong Chhnang is a rural port town with busy markets. Mooring mid-stream, take a boat excursion into the lake side wetlands. This evening enjoying farewell cocktails with the crew. Disembark in Siem Reap and transfer by coach to Raffles Grand Hotel. This afternoon, enjoy a tour of Angkor Wat, the world’s largest temple. Enjoy the sunset over Angkor Wat before heading back to your hotel. Kampong Chhnang is a rural port town with busy markets. Mooring mid-stream, take a boat excusion into the lakeside wetlands. This evening enjoying farewell cocktails with the crew. Ship moors in Prek Kdam. Disembark in Prek Kdam and transfer by coach to Raffles Grand Hotel (approx. 6 hrs). This afternoon, enjoy a tour of Angkor Wat, the world’s largest temple. Enjoy the sunset over Angkor Wat before heading back to your hotel. After breakfast, visit the magnificent Angkor Thom, the Khmer’s last capital, Terrace of the Leper King, and the Bayon Temple. Enjoy lunch at Café D’Angkor Restaurant before visiting Thommanon, Chau Say, Tevoda, Ta Keo and Ta Prohm. After breakfast, transfer to Siem Reap Airport for your flight home to Australia. More information is available in our brochure CLICK HERE! If you wish to extend your stay in either Vietnam or Cambodia pre or post cruise, there are a number of exciting extension options available. Each cabin offers an ensuite, individual climate control and comfy sitting area. The Upper Deck cabins offer the same quality appointments as the Main Deck cabins but you enjoy an elevated view. Sundeck with lounge, library, bar, health club, gym, spa and whirl pool, 360 degrees view. Cruiseco, a consortium of over 200 cruise-specialist travel agents, has over 13 years of professional knowledge, experience and commitment to the cruising industry worldwide. On the back of this continued success, Cruiseco has launched two custom built riverboats to service the increasing number of cruisers keen to discover "Authentic Asia". Cruiseco Adventurer, launched in 2007, was built in the style of a colonial riverboat but with modern luxurious touches. Hand finished by traditional craftsmen and able to travel where other craft can’t. The Cruiseco Adventurer carries no more than 60 passengers amid a relaxed ambience, premium accommodation, local entertainment, enticing cuisine featuring delicious local produce, attentively served by a delightful local crew who are dedicated to providing first class service. Cruiseco Adventurer cruises the Mekong River, departing almost weekly to showcase the captivating array of culture, rituals and ruins. These unique Mekong cruise adventures will take you into the heart of Indochina to discover the ‘true’ Mekong and a special insight into this intriguing part of Asia. The newest ship, Cruiseco Explorer, is custom built for Burmese waters and offers the ultimate luxury. The itineraries afford guests the ideal balance of spell-binding sightseeing and rejuvenating relaxation. The inaugural sailing on 21 October 2014 navigates the Irrawaddy, Upper Irrawaddy and Chindwin waters of Burma on an unforgettable 14 night cruise. The riverboat is restricted to just 56 guests and exudes a relaxed sophistication with a sundeck, bar & restaurant, spa, gym and lounge all available onboard for guests. Entertainment, however, is not limited to the ship's facilities, with evenings on board including skilful demonstrations by local performers.